On a canal boating forum, someone was worried about rumours of a ban on solid fuel fires by British Waterways... They said, "If they ban them we might as well sell it and buy a little, cheap boat again." 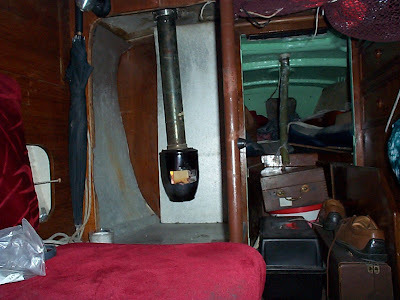 Buy a little cheap boat anyway and then put a wood burner in it and Bob's yer uncle - true happiness. Listen, I went from a small cheap boat to a bigger one which fitted my dreams. Having explored my dreams I now hanker after the joy of that little one again. It's OK 'cos the bigger one is only eight metres anywhow so it still fits the bill for cheap little boat. And it has a chimney so I spend much of the cold months scheming and designing self build wood burners and by the time the design feels right it's Spring again. And so life carries on. A French person with a boat smaller than mine commented on the small size, saying "Ah, she is little...", the refrain came easily, "Yes, small boat, big dreams". I could tell by her smile the French sailor liked the meaning of that answer. . Anything that points the way to human happiness is worth saying. A boat is not a house, it is a container of dreams. We can live in a boat but let's not domesticate our dreams with too much storage space and freezers and television and electric toothbrushes. I'd better not aggravate the big boaters too much, but I saw a little cylindrical wood burner, circa 1930's (in an antiques warehouse) for eighteen quid but didn't buy it because it was too tiny and anyway, it was enough to know I could fit it, having a chimney in place, but it sure did give me pleasure in finding it and assessing the potential as a new burner aboard in comparison with the various ideas I'd sketched out on paper and been pondering over the Winter months. Small boats are more fun and the wood stove you never quite find is the best one - both are as much the dream as the reality. Now, tell me I'm off the wall and I'll agree wholeheartedly. Tell me I'm discontent and I'll laugh my head off. A French antique cast iron cooking stove . Purchased for £50 in a 2nd hand furntiture shop in Bristol. It would boil a large wok full of stew in five minutes. I gave it away in Portugal when heat was no longer an issue but stowage space and weight saving was. This micro stove was a metal plant pot I found floating in the harbour. I cut a letterbox opening to feed bits of wood in. I drilled two holes to bolt it to the chimney flange and voila! Actually it was not succesful because it was too small to heat the boat, although it kept me busy for a while cutting up bits of wood to the size of a cigarette packet and constantly having to feed more bits in as it consumed the fuel so quickly. This stove was adapted from a barbecue. I saw one in France and liked the round belly and shapely legs. Soon afterwards I discovered the very same type in a large hardware store called Bricolage and for just 27 Euros purchased my own. A friend who repaired barges cut me the top with a hole for the chimney and split in two to make a hinged opening. 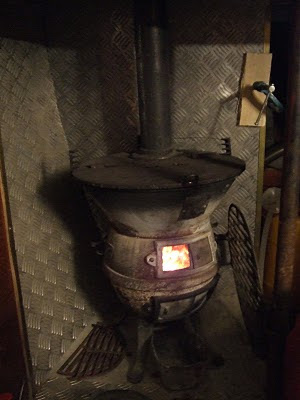 I used this stove succesfully for three Winters. Trouble occured when I changed from burning wood to Home Fire Ovals (long burning coal nuggets). The nuggets kept burning for 24 hours so I was pleased to be able to sleep warm as toast. However one windy night the flues were pushed back down the chimney and I awaoke next morning with a bad headache and unable to get out of bed. I lay in bed with the hatchway open to clear my headache and it was four pm in the afternoon when I struggled out of the boat and realized I'd been poisoned by carbon monoxide. I could only walk a few steps before bending over exhausted. It took an hour sitting in the fresh air to revive my self. When this occured again a few months later I decided to remove the stove and use an electric heater instead. It was the improvised nature of the stove and flue which caused the problem, but the danger did not show up until I began using a different fuel.